It's no secret to anyone who's met my daughter, Lindsay, that she loves lots of things not a lot of almost 20 year olds do. That's ok. It's actually one of the....let's say "sweeter" sides to autism. She'll probably always be a Disney Princess wannabe.... Who am I kidding...I am too and I'm not autistic. :-) Actually at this point in my life I'm more the perfect size of Fairy Godmother! She loves animated movies like Kung Fu Panda, Horton Hears a Who, Robin Hood (the Disney version) and tons more. About a year and a half ago she somehow stumbled onto the Smurfs. I can't remember how she actually found them but she did and they have been ever present since. She's got an amazing eye and can draw them quickly and precisely. She has 2 three inch binders full of Smurfs of all sizes and themes that she's drawn. I keep thinking I'll have to put a gallery on my blog of some of them one day. Needless to say she counted down tot the new Smurfs Movie with great anticipation and we were there in the theater for the first showing the day it opened. Next she started planning how to get all of the Smurf toys that McDonald's is putting in their Happy Meals this month. She has a list and is checking them off one by one as she gets them. She's on a mission! She said last night that it's her "very important job because they are our family heirlooms". Who knew? So today we were talking in the car and I said, "You know....I need a Stampin' Up! 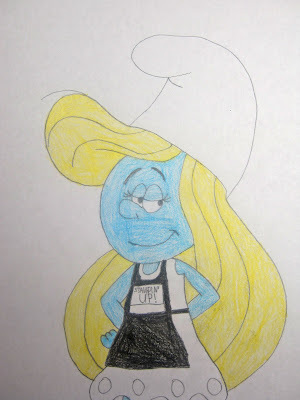 Smurfette'. Well...tonight I got one. Here's the SU! 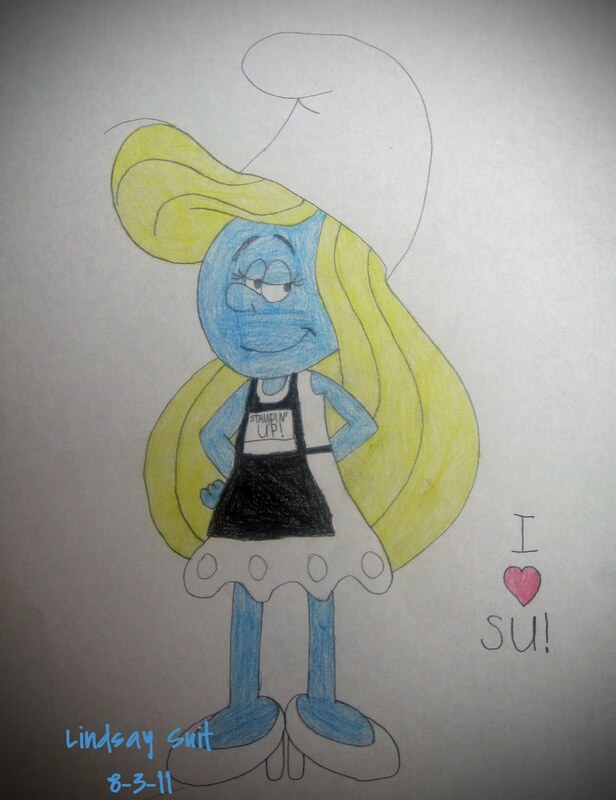 Smurfette she drew for me...complete with my demonstrator apron! I love it and will treasure it always. Linz said, "Mom, isn't she just smurftastic??" I have to say I completely agree. Wishing you a positively smurfy day!